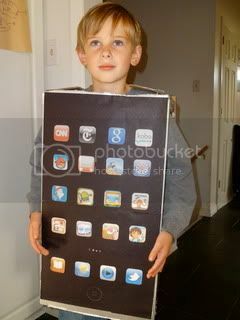 My son, the iPod touch. does he run different apps? if not, those could be a lot of fun to make. He just needs a scary mask now! Ooo, I never thought of that. Good point! It was so much fun to make. I like this idea. Some cardboard, velcro, and extra screens and you have apps! Yeah, but does it have flash?